Question: Is It possible to change the engine computer ? Hi..I have a 1995 Ford Mustang GT. I would like to know if it's possibe to change the engine computer that I have with an earlier one, say from a 1993 or 1994 car. They would both be OBD1 and I can not think of any reason why this could not be done without suffering any ill effects! Shouldn't I be able to unplug the connector on my computer and just plug it into the replacement computer?? The only thing that I can think of as a negetive is that the computer code would be different than what mine is (U4P0). There are a couple of issues that you will need to address when trying to change the engine computer from one year to another. The problems I've had when doing this are twofold. First, even with the same model year, Ford will at times change the programming to create a fix for some potential issue affecting driveability, fuel economy, or emissions issues. Possibility even recall problems. My biggest problems when trying to use a different computer from the same engine family, but different years of the Ford Mustang, or for that matter other Ford family vehicles, has been major changes in wiring color codes and even more importantly, pin locations in the connectors. sometimes the issue is that different vendors have supplied related parts and changed the pin locations, or changes in the computers, but unless you know what you are doing, you could run into problems. My suggestion, would be to look at an aftermarket replacement computer from reputable companies, like Blue Streak, Echlin, and the other major suppliers. They come with a warranty and generally require a core charge, which is refunded when you bring the old one back to the parts store so that it can be repaired and refurbished. While the 1993 to 1995 cars are similar, the emissions standards are different as are a number of the underhood components, ranging from different size and operating fuel injectors, positive or negative back pressure egr valves, O2 sensor locations, and other input and output control mechanisms. 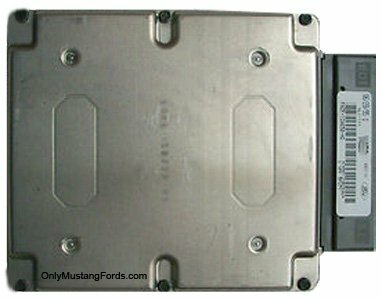 So rather than change the engine computer for another version from a different model year of Ford's pony car, you might also want to look at swapping a different computer from another 1995 Mustang. I am curious as to why you are looking for an earlier ECM. Is it simply that you can get one for cheap or for free or are you looking for something specific that you've heard about the 1993 and 1994 engines that you believe will improve your 1995 car? Either way, that's my 2 cents. Good luck on your on board computer swap.